Today, I want to talk to you about a very important distinction that I know will help you in determining the action you need to take to get the results you want in your life and business. And I must begin by saying that although I always start with mindset, because everything starts with our thoughts, results are all about action! A lot of you may feel like you’re taking action but what I’m sharing today will clarify whether or not that action is contributing to you feeling stuck or attaining the success that you’re looking for. How would your life change if you start taking the kind of action you can fail at? I’m going to give you a little podcast homework that will help you to take a good look at the action you’re taking and decide whether or not it’s actually going to get you the results that you want. Listening to the podcast is great but you have to apply what you’re hearing and take action, my friend! If you would like an opportunity for a free coaching session with me, recorded and aired on the podcast as a bonus episode, follow the instructions HERE to rate and review the podcast on iTunes. I am so grateful for those of you who leave a review and who are open to being coached! 2 types of action we can take and the difference between the two. Why taking passive action can add value but won’t create tangible results. How to tell if the action you’re taking will get you the results you want. Why the risk of failure is an important factor in determining which kind of action you’re taking. Why mindset work is impactful but not as transformational as active action. What you can do after each episode to help you take action on what I’m sharing. Enter for your chance to be coached, for free, by yours truly for a bonus episode of Soul CEO! Hey, guys, how are you? I am so excited to be recording today and it’s so funny because probably from y’all’s perspective, you think that I record every week because you get an episode every week, but I actually want to give myself a little pat on the back because I’ve done a really great job of recording my podcast episodes all at once. So I’ll record three, four, even five at a time when I’m in super-inspired mode and I will be way ahead of the game. So I’ve been really happy with how that has happened and now I feel like I haven’t recorded in a while. So I am really excited to be back here and recording some more content and some more value to give you guys. Like, this seriously just sets my soul on fire. Sharing these things that I learn throughout my daily life and things that I coach on, it’s just been the coolest experience ever. And I also want to celebrate and express my gratitude for all of you guys and the amazing reviews you have been giving me. I am blown away. And I did some fun giveaways; the Airpods and the Kate Spade purse. So that was amazing and I just want to thank you guys for your participation in that and for sharing this podcast and giving me your feedback. Like, there’s nothing that makes me more excited than to see that. So I’d be so grateful if you’d keep doing that. And I just want to say how much I love you guys and I just have the best audience. I have the best people that are in my tribe, so thank you, guys, so much for all of that. So I’m excited to talk about today’s topic because it is something that impacts so many of my clients and so many of the people that I talk to. And it’s all about action. So I want to be super clear that in all of my work as a coach, I always start with the mindset and the thoughts and the feelings that we have around the action that we take. So that’s where I will start with any client and in any coaching. And I want to make sure that’s super clear, that the action you take is going to create the result that you get but the thoughts that you have when you take the action and the feelings that you have behind the action are going to be what generate the result that you get and the type of action you take. So it has to start there. It has to start with the mindset. It has to start with the thoughts. but in order to create a result in the real world, you have to take some sort of action. So I guess we could do all the thought work in the world, it would be really nice if we could just sit on our couch and think about what was going to happen and it’d happen. But we have to take some sort of action. So once you do the thought work, once you have the feelings, what’s really going to generate that result is the action that you then take and the actions you continue to take. What I’ve realized is that there are two types of action that we can take. One of them creates results and one of them creates no results. So basically, one of them will generate the result you want or maybe not the result you want and the other will make you feel like you’re getting results or make you feel like you’re taking action when you’re not. 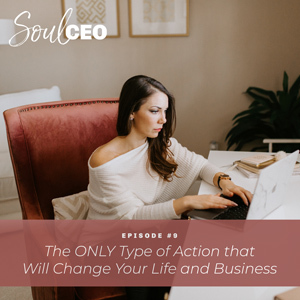 So it’s kind of tricky and it can make you feel really stuck because you feel like you’re taking all this action, but you’re actually not and you’re not going to get the result that you want by taking this type of action. So let me explain to two types of action. There is what I call passive action and active action. So let me define both of these and then I will explain what that looks like and examples of it so you can pinpoint what kind of action you are taking and then we’ll dig into why it’s important to understand this and how you can make a shift in it or how you can recognize in your life which one you are taking and how to shift that. So passive action, essentially, is any sort of action that doesn’t create the result that you want. For example, if you were reading all the books about coaching – and yes, while that’s super important, I’m never going to say that becoming an expert in your field and continuing to grow isn’t vital, it absolutely is. But if your goal or the result that you want is to get clients and you’re sitting at home reading books, right, that doesn’t correlate. You’re not going to get clients from reading books. You’re going to add value by reading books, but there has to be a different sort of action. So, passive action is action that’s happening, kind of, like in your mind or is happening behind the scenes. And it’s not that it’s not important, it’s that that’s not going to actually generate results; like physical tangible results that you’re looking for. So, I always like to use this as an example because it shows the type of action that I took early on in my business and it shows the value of it. So when I started my coaching business, I did not have a website, I didn’t have a logo, I didn’t have exact coaching packages or plans or anything like that and I didn’t even have a Facebook business page. It was there – and honestly, it’s still not that fantastic. I use my personal Facebook still and I do have a business Instagram page and I’m working on building it, but I didn’t have any of those things. And so, what I see so many business owners and so many people who want to grow businesses do is when they have an idea, they want to go to work to build all of these behind the scenes things, the website, the logo, the business plan, all of those pieces. Again, while I’m saying those aren’t important, what’s more important is getting clients and generating results and showing that you have value to add. So I would consider building a website, having a logo and all of that important action, but passive action, or like I said earlier, reading books and learning – and all of you guys are here learning and I want you to keep doing that, it’s super important. But if you don’t actually take any tangible physical action that is tied to the result that you want, nothing’s going to change and nothing’s going to happen. And if it’s not, then you might be stuck in passive action or you might be stuck in some sort of action that isn’t serving what it is that you want. So that’s passive action. Active action is taking an action that is out in the physical world, that is going to create results, that is going to be the direct correlation between the action you take and the result that you get and the result that you ultimately want. So that would be something like what I did early on in my business when I first started is, going out and talking to people. If the result I want was to build clientele and to build a business, I knew that having conversations with people and having coaching conversations with people were going to be what created the result of signing clients. And for me, another active action – it could be passive action, but an active action for me early on was posting and sharing my journey and building relationships with people on social media because I knew if I gained people’s interest and added value through that then that could result in conversations. My only goal early on was to have conversations with people because I knew that was going to generate clients. And that’s how I was able to build a business without having all of those pieces and leave my corporate job without having a website because of all the active action I took. So active action is action you take in the physical world that’s directly linked to the result that you want. So if you’re a little confused and that sounds complicated, here is what I realized today to quickly and easily define whether you’re taking passive or active action. And that is this; if you can actually fail out in the world – like there could be a failure, something could go wrong, you may not get the result that you want, like the actual result, whether that’s signing a client or not signing a client or building your business or not building your business, which would be signing clients or having customers, then it is not active action. So you have to actually be able to fail. Not like a mental failure. Not like a mental, like, getting stuck somewhere or a mental block. And again, getting around those is very important because it doesn’t matter what action you take if you don’t have the right mindset. But you have to take action to generate that mindset and to work on the things that pop up for you. It’s not about waiting and doing the mindset work and then taking the action. It’s about doing the mindset work and taking the action simultaneously. So you can see what happens – maybe you fail, maybe you figure out where you’re blocked, you do more mindset work and then you take more action. So if you can fail out in the real world if you can sign a client or not sign a client. And when I say fail, I mean fail on the actual tangible result that you want, then you are taking active action. If you cannot fail in the physical world, or you can fail but it’s not a failure that’s not directly associated with the result that you’re looking for, then it is passive action. So, I would take a good look at all of the action you guys are taking and figure out, is it directly going to create the result that I want? And if it’s not, what action items do I need to be taking that are going to create the result that I want. Because if you are constantly staying in passive action – while your mindset can change, yes, that’s amazing and other things can change and you’ll have a pretty website and you’ll have a great logo and maybe you’ll have business cards, you’re not going to have a business. Because here’s the other thing about mindset – and I want to be really clear with this because I am constantly preaching about doing the soul work, doing the inner work, doing the mindset work – that you can’t actually experience transformation in the mindset work unless you’re taking active action. Think about it, if I’m learning about being vulnerable, say for example, and I have all these mental transformations and I see, oh my gosh, I’m blocking myself, I am trying to hide from people. Oh my gosh, I’m having all of these realizations. While that’s really impactful, where the transformation is actually going to exist is in active action when I get the opportunity to be vulnerable; when I push myself to be vulnerable. So when I decide to share a story on social media that scares the crap out of me and I’m so afraid to be judged for it or whatever it is, that’s actually making transformation in the physical world; that’s taking active action. Or, if I’m working on building trust with people and mentally I’m learning all the pieces of understanding how to build trust and where it’s blocking me and why it’s important and may be where the fear comes from and all the things where actual transformation is going to happen, the result that I want, to learn how to trust people, is trusting people in the physical world when I get that opportunity, or when I create that opportunity. So it’s even the same thing with mindset work. You can take passive action in mindset work, and that would be listening to all the podcasts and reading all the books and taking a billion notes, but then not actually taking different action because of it. Or you could take active action, you can take little bites of what you’re learning or all of the stuff that you’re learning and writing down and actually go and apply it; doing the work, taking active action to generate the transformation. And that’s the difference between the people who get massive results and have massive success and who don’t. And again, I think it’s such a sticky thing because passive action feels like action, but it really isn’t going to get the results that you want. So for you guys, I want you to identify what result you’re really looking for. And then I want you to look at all of the action you’re taking right now. Write it all down. Like, I’m giving you guys homework on this podcast. Write down the result you really want and then write down all the action you’re taking. And I want you to look at the action items. And do these action items actually generate that result? I’m not saying, like, do they add value to the result, do they help with the result? I’m asking you, do they actually create the result? If I want to get clients, is building a website, is posting on social media, is doing all these things necessarily getting me that direct result? No. Like I said, posting was a part of my active action, but if I don’t have conversations with people, there will be no clients. If I don’t talk to people and build relationships and have coaching conversations and consults, there will be no clients. So when you look at this list, I want you to identify if you’re taking any active action items that are actually going to create the result that you want. And if you’re not, figure out what those things are. And it’s not that passive action isn’t important, like I said, I have a website now. I do take passive action, but I always know my active action needs to come first and it needs to be the priority. I need to spend as much time possible on that type of action versus the passive action. So which type of action are you taking? And think about how your life would change if you figured out and if you started taking active action; the type of action that you can fail at. Because the way that you learn and you grow and you get transformation is by failing and learning and growing and trying it again or putting yourself out there and doing it again. The way you get better at consults or pitching or sales is by actually doing it, not reading about it. It might help to read about it, but that’s not actually going to make you better. So I want you guys to take this, even if you’re not building a business, even if you’re not trying to make some massive result occur in your life, you’re here listening so there’s obviously something that you’re working to change in your life. And I want you to think about what you’ve learned so far in this podcast and what you are seeking and what you want to learn and ask yourself after every episode, what active action item can I take, instead of what passive action item can I take? So this list that I told you guys to write, that’s passive action. Where the real transformation is going to happen is when you identify the active action item and then you go take it. So I’m so excited for you guys to hear this episode because I think it can create massive results if you really go to work to take active action. And it can be scary because failure is there. But I will tell you, I’ve fallen on my face a thousand times and it’s what has gotten me to where I am now; so you have to go through that process. So, I love you guys, I would love to hear your feedback and I am so, so excited to continue to watch you all on your journeys and transformation and tons and tons and tons of active action. So I love you guys and I hope you have a beautiful day and I will talk to you soon.